ENGLEWOOD, Colo. (AP) — The Vic Fangio Era began in Denver without one of the Broncos‘ best defenders and a potential contract standoff looming. “Yeah, I won’t be there,” cornerback Chris Harris Jr. texted The Associated Press before the Broncos became the fourth team to start their offseason program. Entering the final season of a five-year, $42.5 million deal he signed in 2015, Harris is due $7.8 million in 2019, after which he’d become an unrestricted free agent. One of the NFL’s most versatile defensive backs, Harris first raised the prospect of a stare-down with general manager John Elway four months ago after the Broncos missed out on the playoffs for the third consecutive year. 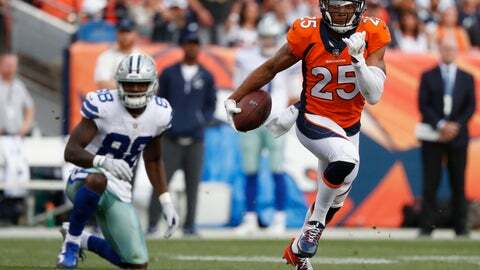 Those changes included Vance Joseph’s firing and safety Darian Stewart’s release, which left Harris as the last remaining original member of the “No Fly Zone” defense that helped the Broncos win Super Bowl 50. Elway, who signed two defensive backs in free agency, has said he would like to work out a new deal with Harris after the draft later this month. Elway signed cornerbacks Bryce Callahan (three years, $21 million) and Kareem Jackson (three years, $33 million) in free agency last month. Jackson’s deal includes salaries of $11 million in 2020 and $10 million in 2021, and he turns 31 this month. Jackson was the best cornerback on the market, and pairing him with Harris gives Fangio enviable flexibility in coverage as both cornerbacks can line up in the slot, on the outside or even at safety. With mandatory veteran minicamp two months from now and the start of training camp more than 100 days away, Harris’ absence Tuesday didn’t raise many eyebrows. “I mean, it’s optional, right?” said linebacker Von Miller , who skipped the Broncos’ offseason program following his Super Bowl MVP performance three years ago during a contract stalemate. “We all know what type of pro Chris is on and off the football field, and he’s going to be ready to go whenever he’s here. And if he’s not here, he’ll still be ready to go. Harris is coming off a stellar 2018 season despite missing the last month with a broken right leg. The only NFL player with multiple interceptions in each of the past seven seasons, Harris picked off three passes, returning one for a touchdown, and broke up 10 passes in a dozen games last season before getting hurt at Cincinnati on Dec. 2. The Broncos lost each of their last four games during Harris’ absence. He returned a month later to play in his fourth Pro Bowl, intercepting a pass in the AFC’s 26-7 victory.